Szuter Treatment Systems specializes in Norweco Aeration septic systems and performs maintenance and service on American Manufacturing Drip septic systems, all mound septic systems as well as pumps and controls on Residential and Commercial septic systems. Szuter Treatment Systems is a licensed distributer for Norweco Aeration septic systems for both commercial or residential design & installation. Norweco is a manufacturer of water and waste water treatment products, systems and chemicals with innovation and service unmatched in the water and waste water treatment industry. American Manufacturing is another provider of equipment we install along with other more conventional means that provide us with a toolbelt of options to give you the best possible options to serve the property owners for years to come. Szuter Treatment Systems performs annual and semi-annual inspections of septic systems when required by the Local Board of Health. We also inspect systems for real estate transfer and For Sale of Property inspections. Certified test results are filed as required with local officials when necessary. Jeff Szuter has over 25 years of experience in this field and typically averages forty septic system installations per year. He has been an O.O.W.A. installation qualified contractor since 2004 and has also attended continuing education through Ohio State University in relation to work in his field. Through these relationships, he has an up-to-date knowledge of septic rule changes as a result of H.B.231 legislation. All septic systems have a finite life span. In most cases, it is impossible to predict if your septic system will last 3 or 30 years. But you can protect your septic system from costly breakdowns and repairs with periodic septic inspections. As soon as a house is put on the market. This will enhance the home’s value and avoid any liability issues that might result from a malfunctioning system. Septic tanks should be checked for buildup every 1 to 3 years until you can get on a predictable pumping schedule. Most septic tanks need pumping every 3 to 5 years. How often depends on the size of the tank, the number of people in the household, and the amount and type of solids entering the tank. Inspect the condition of the septic and pump tank and report the structural condition and suggest when the pumping should be done by measuring the scum and sludge levels. Inspect the drip field area for wet spots or other issues. If we find a leak in the tubing, we usually do not charge for that repair if done at time of routine service. Clean and inspect the disc filters. Run a test cycle to inspect the hydraulic unit for leaks, and proper functions.Check the control panel for proper functioning. Check the dosing and flush rates which tell us about the general health of the system. Record results, then fill out and file the necessary paperwork required by the county Health Department. I moved into a home with an old antiquated drip septic system. 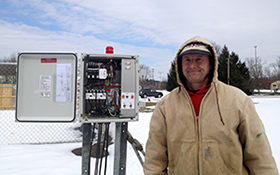 When pump and PLC controller failed, Jeff was able to locate replacement parts to refurbish the system. Everything has worked fine for several years now which saved me thousands to replace with a new unit. Where Is My Spectic System?